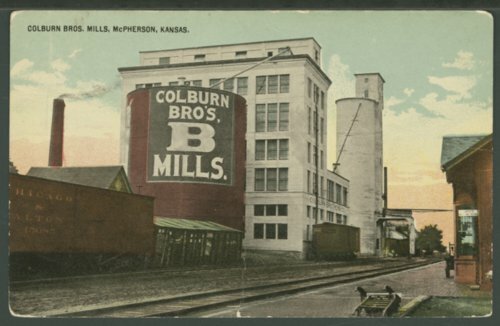 This postcard shows the Colburn Brothers Mill in McPherson, Kansas. The company was founded in 1880 by Edward Alva Colburn and John C. Hamilton. The facility was operated by the Colburn family until Edward's death in the 1930s when it was sold to KBR Mill. The postcard was addressed to Mr. George A. Root at the Kansas Historical Society.